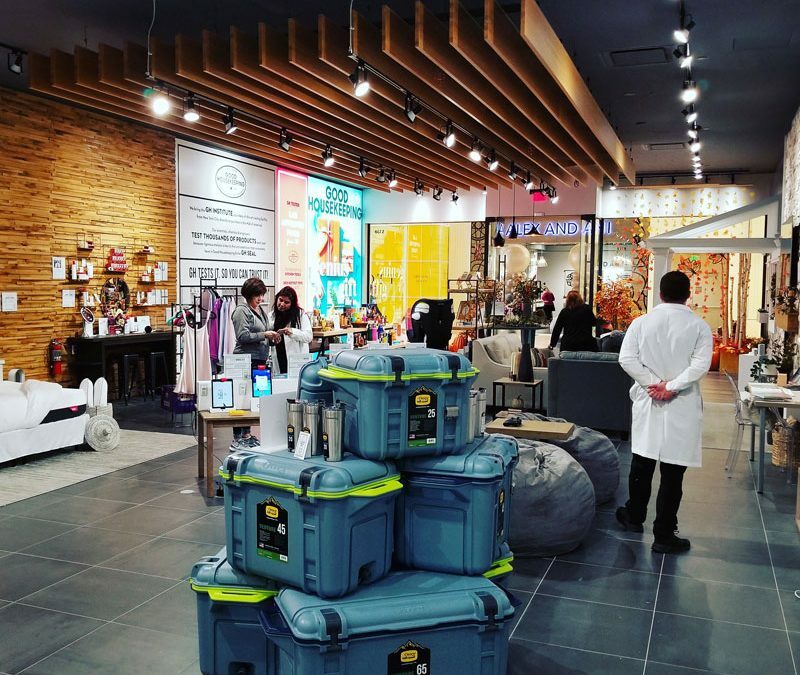 The new GH Lab store at the Mall of America is a partnership between Good Housekeeping and Amazon—and it’s a convincing look at the future of retail by offering a better experience both for the retailer itself and the customers who browse this carefully curated store. It’s likely no coincidence that GH Lab is sandwiched between an Apple Store and a Microsoft Store. The storefront is glassy and transparent, and the interior is akin to upscale furniture or home goods store where virtual rooms are set up—spa-like bathroom, modern kitchen and cool, techy living room with giant beanbag chairs. The design encourages shoppers to browse with the knowledge that there are no stinkers for sale—every product on display is recommended by the exhaustive testers at Good Housekeeping. That’s why the sales associates wear white lab coats. If you’re old enough, think of Aha’s video for “Take On Me,” where suddenly you’re thrown into the pages of a comic book that’s come to life. In this modern-day instance, it’s like you’ve been transported into your computer screen, walking inside the beautifully designed brick-and-mortar store that is Amazon.com in the flesh. Little placards accompany every item, from bottles of hand lotion up to expensive kitchen appliances. The placards have brief descriptions of the product and Amazon’s own take on QR codes, SmileCodes that you scan with the camera function of your phone’s Amazon app. Having never realized my Amazon app had a camera function, I was surprised how easy it was to throw a product into my virtual cart with two, maybe three clicks. The implications of this experience are endless. What products would you prefer to see and touch before you buy? Looking at my own recent brick-and-mortar purchases, a new dining room rug, blue jeans and body wash were items I wanted to hold in my hand, rather than hoping for the best online. Comparing that to the products for sale at GH Labs, it seems that some of this potential is lost, as a new large-room air purifier, robotic vacuum cleaner or video game systems aren’t the kind of things I need to touch before buying. For me, those purchases are all about reading reviews and shopping around for the best deal. Nevertheless, I loved my time at GH Labs. Not wanting to spend a fortune after receiving a spousal warning a few days ago, I splurged on a $14 Instant Pot cookbook just to try the service. Two clicks, submit, done—that’s truly all it takes. I didn’t need the book that night, and it is scheduled to arrive less than two days later with free shipping. There are many variants on new-age stores that are being billed “the future of retail.” For me, it depends on the product, my current location and what kind of mood I’m in. Certain non-essential or non-immediate needs are best bought online for the sake of convenience. When I’m trying to redecorate a room and want immediate results, a real store is still best. For things like clothing, personal-care products or a pair of shoes, I want to try them on, walk around a bit and maybe glance in a mirror before plunking down the cash. I laughed overhearing one associate explain the store to a lady who wandered in. He made it about 10 seconds before she said “I don’t have the internet, so I’ll be passing you by.” It was funny, but obviously she’s an outlier. For this prolific click shopper, I appreciate the filter applied to the products that were all Good Housekeeping approved. Who ever clicks on one-star-and-up rated products anyway? This story is only a pop-up for the next few months, but the appeal of the format is clear. Version 2.0 needs to be refined with products that actually need to be seen, touched or experienced before purchasing. At that point, retailers should rejoice, because they’ll truly be in the business of delighting customers, rather than stocking and replenishing inventory. Who’s got time for that?